You can thank Google for the competition. When the original Echo Show debuted last year, plenty of people (including us) made fun of its chunky and bulky design. Well, Amazon must've taken those comments to heart, because the new Echo Show is decidedly much better looking. While the older Echo Show might've reminded us of mall kiosks, the newer Show looks a bit more like a smaller, cuter TV. I tried it out briefly, following the Amazon announcement earlier today, and the first thing I noticed is that it's much more minimalist in design, with a beautiful 10-inch HD display dominating the front. It even takes up less counter space than the Google-powered 10-inch Lenovo Smart Display. Not only is the display sharp and colorful, but I also think the visuals are a lot less sterile than before. Looking up recipes now, for example, doesn't just display text on a screen. In my demo, I searched for chocolate chip cookie recipes, and it displayed options very similar to how Google's Smart Display does. What's more, the recipe instructions come with step-by-step photos and video, which isn't even an option for Google's Smart Display. Right now Amazon has partnered with Kitchen Stories, Allrecipes, Epicurious, Food52, TheKitchn and SideChef to provide these recipes, with possibly more to come in the future. 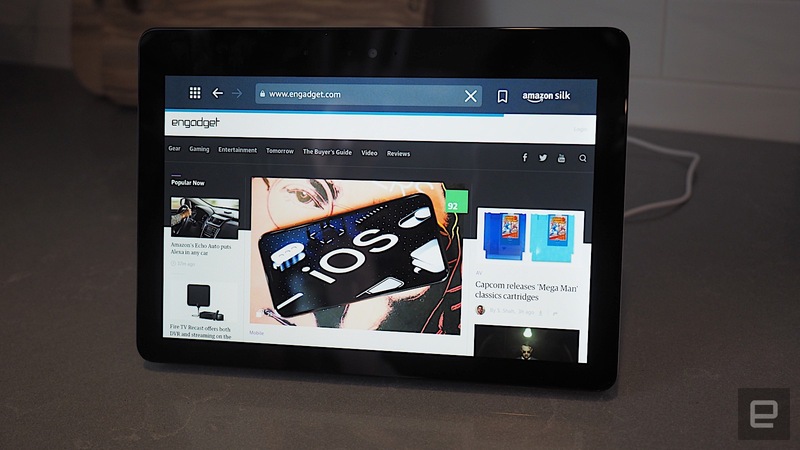 One particularly notable feature of the new Show is that it has support for either Amazon's Silk browser or Firefox. Not only does this open up the search function considerably -- now you can just go to Wikipedia directly, for example -- you can also now watch videos on YouTube on Youtube.com. Sure, Google may have taken the YouTube app away from the Echo Show, but it can't stop you from accessing the site from the web. Smart move, Amazon, smart move. Still, we should note that while you can use your voice to open the browser (by saying "Alexa, open Silk"), you generally still have to enter in the URLs manually on the keyboard or tap the microphone to trigger voice input. In other words, you can' t just say "Alexa, open Engadget" for it to go directly to this site. Then there are the Echo Show's new entertainment features, with new integrations with Hulu, NBC and Vevo. Say "Alexa, watch ESPN on Hulu" for example, and it'll come on. The Amazon spokesperson said "Alexa, play Cardi B music videos" in the demo and sure enough, Vevo started playing Cardi B's "I Like It." The audio quality is also vastly improved, with crisp highs and a deep bass. This is thanks to dual side-firing 2-inch Neodymium drivers, a passive bass radiator and Dolby processing. We weren't able to test them out at the event, but the new Echo Show also has integration with Ring and August doorbell cameras so you can see who's at the door (a similar feature is on Google Smart Displays too), a built-in Zigbee smart home hub, and the ability to make video calls with Skype. Earlier this year, we thought that Google's Smart Displays would easily trump Amazon's Echo Show. But now, with the introduction of video recipes, a built-in browser, new entertainment features and so much more, Amazon might very well give Google a run for its money. The new Amazon Echo Show will ship in October for $230, and is available for pre-order today.